Let’s admit it, one of the biggest reasons you want to go on holiday to Byron Bay is hanging out at some of the most beautiful beaches in Australia. Going surfing, swimming or just relaxing on the sand are some of the top things to do in Byron Bay, and going on holiday in the summer is especially all about the sand and surf. But we all know that you can’t spend all day out in the sun and sea without following beach safety tips. Due to Australia’s proximity to the equator, the UV strength of the sun’s rays are moderate to extreme most of the year. In addition, the ozone layer here is thinned, thus allowing more harmful UV rays to reach the earth’s surface. Armed with this knowledge, it’s not surprising that, according to the Cancer Council of Australia, Australia has one of the highest rates of skin cancer in the world. What this means is that it’s extremely important to protect yourself when outdoors enjoying the many excellent things to do in Byron Bay. We offer up this sun safety and water safety advice to make sure your holiday is fun in the sun, not pain from the sun! The beautiful beaches, the amazing waves and great weather conditions—especially during the summer months—make Byron Bay an ideal location for a holiday. During a holiday to Byron Bay, you’ll want to spend plenty of time exploring these gorgeous beaches, trying out many of the fun water-based activities or even just sitting outside for a meal with a view of the ocean. But what about the intense Australian sun? No need to worry, you should absolutely participate in these fun things to do in Byron Bay, but just follow these sun protection tips to make sure you don’t get sunburned or risk overexposure to UV rays. Slip on UV protection clothing. Slop on broad spectrum, water-resistant sunscreen of at least SPF30. Slap on a hat (one that protects not only your head but also your face, neck and ears). The Cancer Council of Australia adds two more to list: slide on sunglasses and seek shade. To expand on the different aspects of this sun safety rule, let’s first discuss UV protection clothing. A typical cotton T-shirt, something that many people tend to wear to the beach, doesn’t offer much in the way of protection. Cotton allows as much as 1/5 of UV radiation to pass through to the skin below. Therefore, it’s recommended that you purchase specific UV protective clothing that is UPF50 and blocks out most of the UV radiation. For example, SunProtection Australia, a company started by Warren and Kerryn Meanwell and based in Byron Bay, makes clothing that has an Ultraviolet Protective Factor of 50+. The company features UV protection clothing, hats, gloves and sunscreen for men, women and children. The fabric used for the company’s clothing blocks 98 percent of harmful UV rays, providing you protection so you can still spend holiday time out on the famous beaches. Apply the sunscreen 20 minutes before you go outdoors and every two hours thereafter. Only expose your skin without sun protection in early morning hours (6-9 a.m.) and after 4 p.m (when the UV Index falls below 3), and the best sunscreen to wear is SPF30+ along with protective clothing at all other times to avoid those intense UV rays. Choosing hats that cover the face, neck and ears of kids, especially babies. Always make use of shade or create shade using the pram or play area. Tip: Make sure it’s a dark shadow as you don’t want scattered or reflected UV rays to continue to expose young children. Watch the clothing to make sure it doesn’t get bunched up or slide up and expose an area that is not covered with sunscreen. Apply a SPF 30+ water-resistant sunscreen to areas that can’t be protected by the clothing like the neck, ears or hand. Make sure to do the face since a hat can’t completely protect it. Also, note that everyone in the family should wear protective eyewear! And, finally, don’t forget about the need to hydrate. Pack water in your beach bag for everyone in the group and make sure they keep drinking throughout the day. Apply cool or cold compresses to the sunburnt area. Check in with a pharmacist about products to soothe it. Tip: Spray-on solutions might be easier on your skin than creams you need to rub into the area. Take over-the-counter pain relief if needed. Seek a doctor’s treatment if your burn is severe and is causing you to feel nauseous, dizzy or vomit or if you have a fever. But the best way to avoid these issues is to take precautions and protect yourself! Now it’s time to head into the ocean and enjoy one of the many water activities that you hear so much about in Byron Bay from kayaking, to swimming. Check out our posts about some of the water activities you can try out while on holiday in Byron Bay! However, before you head off to do any of these fun things, keep in mind that being in or even near (or above in the case of kayaking, sailing, SUP, etc.) water can increase your UV exposure through reflection. Even sea foam and dry beach sand increase your exposure. In addition, the water (and sweat) can wear off your sunscreen faster, so remember to reapply more often so you don’t risk sunburn. Lifesavers patrol Byron Bay beaches most heavily during the summer holidays, but do provide year round life saving patrols at Main Beach and Brunswick Head Main Beach. Check out this schedule for more information about the hours you can ensure your water safety is taken care of during your holiday. These rules are general water safety tips to follow for swimming and surfing. Locate the red and yellow flags when you reach one of the beaches. Always, always swim between them. The flags mark the safest places to swim. Swim and surf at beaches patrolled by lifesavers. Read and follow the safety signs, which identify potential issues and conditions on the beach or in the water. You’ll normally find these at beach access points and the flagged areas. If you feel unsure about conditions of the water or anything else regarding your safety, ask a lifesaver. Water depth, currents or wave sizes and types change quickly and frequently, so it’s best to check with a lifesaver who can give you the best advice about the state of the ocean. Always swim with a buddy—a friend, another family member or partner—so you can look out for one another and alert for help if necessary. Don’t ever run and dive into the water. And finally, for families, keep your children, especially young kids and anyone who isn’t a strong swimmer, within arm’s length. Unpredictable surf can knock over a kid quickly. Don’t forget: If you get in trouble, raise your hand up and flag down a lifesaver for assistance. Don’t try to swim against the current or rip, but rather float and wait for someone to come out to you. Follow these swimming safety tips, and you’ll be able to take advantage of the gorgeous ocean at Byron Bay beaches. Bring your sunscreen, your cozzie and sunnies (and more!) to Byron Bay for a summer holiday and take advantage of the amazing beaches. Follow these safety tips, and you’ll be ready to take part in any of the excellent things to do in Byron Bay in the great outdoors from surfing and snorkelling, to kayaking and SUP. But in order to participate in these fun activities, you’ll need to keep the rest of your holiday on track budget wise, so plan to stay at Broken Head Holiday Park. 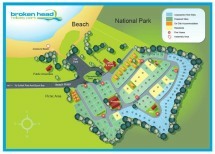 There you and your mates or family can stay in great beach accommodation at prices you’ll love.